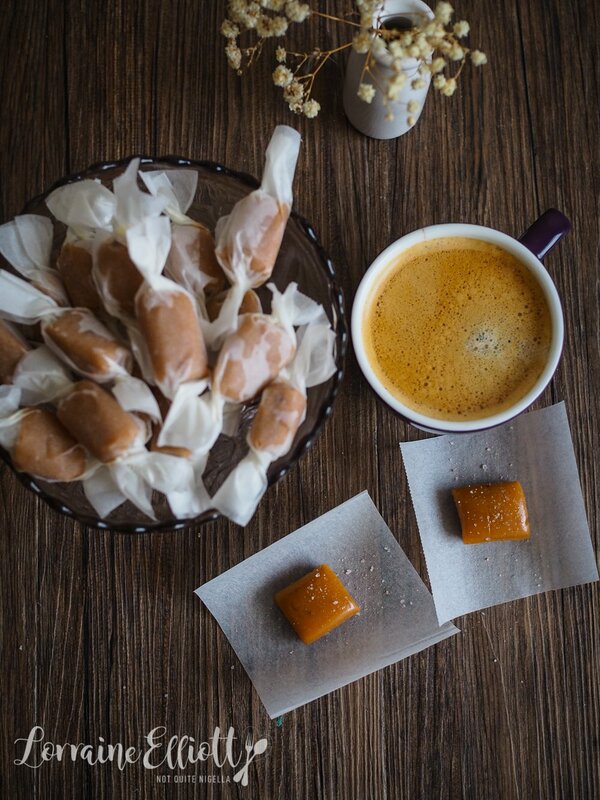 Ever made your own caramels? These peanut butter salted caramels are such delicious little sweeties. 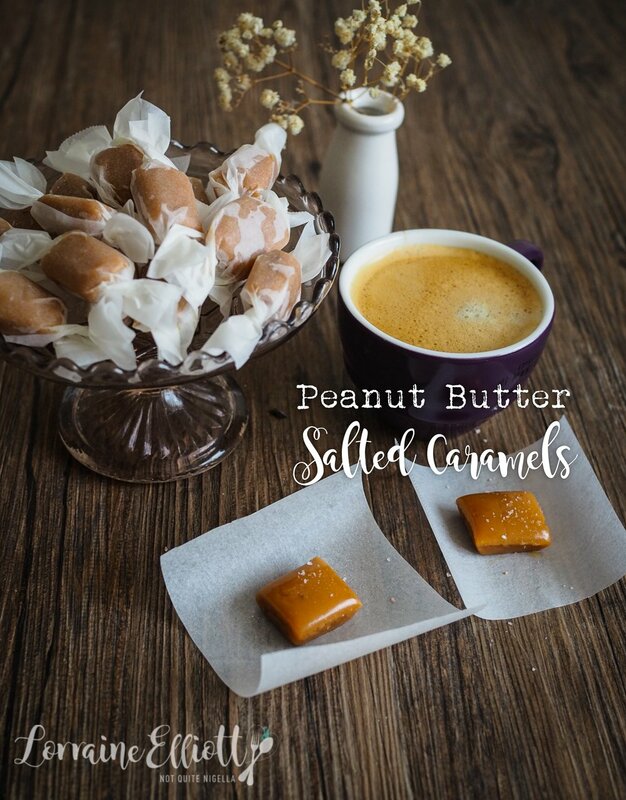 With just enough peanut butter flavour in the salted caramel you may find yourself unwrapping one after the other! And if you're looking to make an edible gift this recipe makes plenty, plus they keep and transport well so they can be posted to people! When Faith posted these before Christmas, I match a batch so that I could make edible gifts for the in laws. We don't really do presents because there are so many people in the family but I hate showing up empty handed. And honestly this made enough for 10 people to receive a bag each plus some left over for my family. 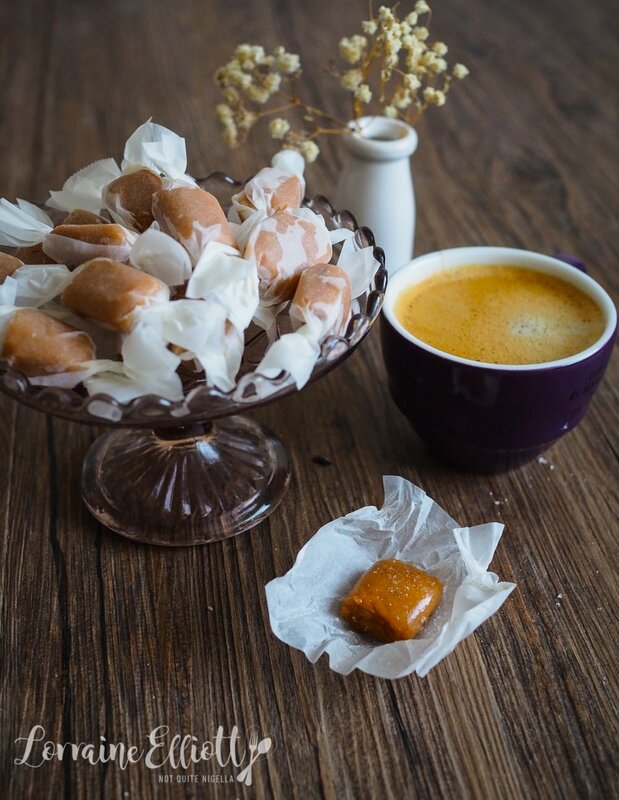 These are soft caramels with a great balance of peanut, caramel and salt. They are addictive and melt in the mouth. The only thing I will say is that wrapping caramels individually is probably the only thing that is time consuming about these. When you cut up wrap over 100 caramels by hand, suddenly the idea of giving someone a huge bar of caramel seems very appealing. I wanted to quit it halfway through but presents needed to be made so I kept going. I mean for someone that cooks and thrives on work I feel like I am conversely also quite lazy. I am so lazy that I got out of bouldering by saying that I didn't want to because I would break a nail. True story. I mean I don't think I should accept an invitation for bouldering if I don't even know what it is. I'd much rather be cooking caramels in my kitchen and wrapping up a hundred of them! 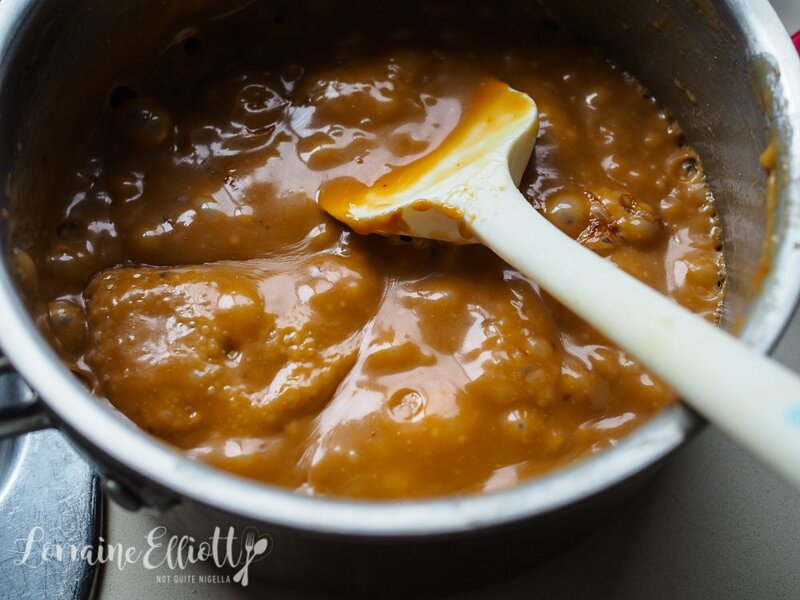 So tell me Dear Reader, have you ever made caramels before? Do you like peanut butter or nut butters? And do you know what bouldering is? Step 1 - Line a 20x20cm (8x8 inch)square pan with parchment. Melt butter and add glucose syrup, sugar, cream and peanut butter. Bring to a boil stirring constantly to make sure that it doesn't catch. You need it to reach 118C/246F (you will need a candy thermometer or a temperature gun for this as it is almost impossible to guess). Step 2 - Remove from heat and stir in the salt and vanilla. Pour into the dish (be careful, it's very, very hot) and allow to cool completely. Oil a hot knife and cut into pieces. You will get so many caramels out of this that the longest time will be spent cutting and wrapping them. I think I got almost 100 caramels. 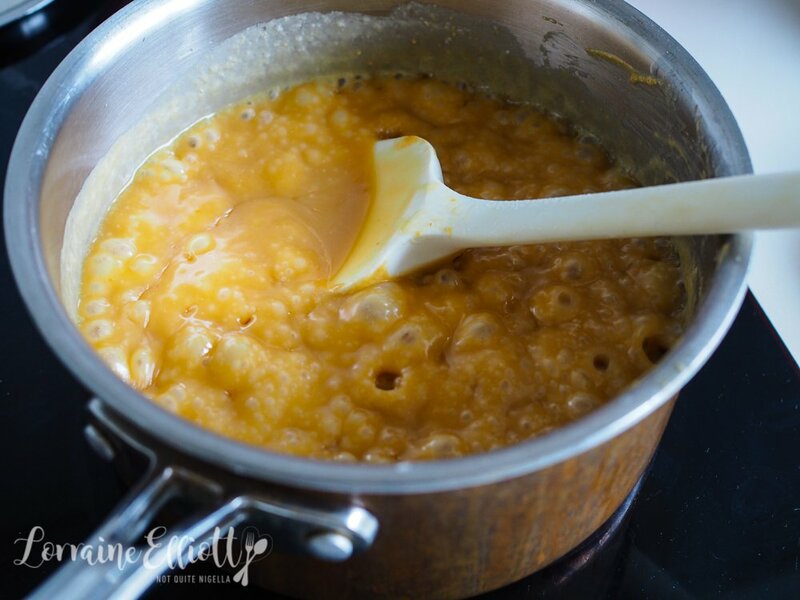 recipeThe Life Changing Bannoffee Peanut Butter Chocolate Caramel Slice! recipePeanut Butter & Strawberry Jam Iced Donuts! recipe The Life Changing Bannoffee Peanut Butter Chocolate Caramel Slice!